William (Billy) Snyder, 80, of Waynesburg, passed away Tuesday, April 2nd, at the Ephraim McDowell Regional Hospital in Danville. William was born in Waynesburg on October 3, 1938 to the late Charlie and Okie (Maggard) Snyder. He was a member of the Mt. Hebron Baptist Church and loved history and learning about the civil war. 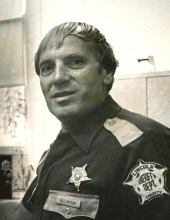 Bill was elected as Lincoln County Jailer in 1986 and a second term in 1990. Due to his health at the time, Bill was forced to retire near the end of his second term in office. Early in his work career, Bill built greenhouses all over the country before returning back to his native Lincoln County home. Visiting Hours will be after 5 PM until 7 PM on Saturday prior to the memorial service on Saturday. To send flowers or a remembrance gift to the family of William "Billy" Snyder, please visit our Tribute Store. "Email Address" would like to share the life celebration of William "Billy" Snyder. Click on the "link" to go to share a favorite memory or leave a condolence message for the family.